We offer individualized horsetraining with riding lessons, riding lessons, and equine management consultation on the Colorado High Plains in full view of the Rocky Mountain Front Range. Rhythm beads are also available at the Trading Post. We have over 40 years of combined horse experience and use gentle, natural methods. After training by High Plains Horsebreaking Co., your horse works for you because he respects you and wants to please you. We encourage owners to watch us work your horse and to ask your questions at the end of the training session. This is your opportunity to connect with your horse for the ultimate lifelong partinership. We suggest that owners take advantage of our riding lessons on your newly-trained horse so you know how to work and ride him. We are experienced with geldings, studs, mares, mustangs, and mules. 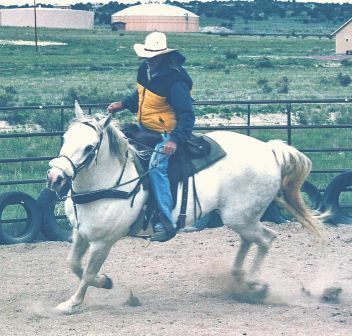 We train at High Plains seven days a week by appointment, you transport your horse to and from High Plains or we'll come to your Pueblo or Pueblo West location. $35 - 1 to 1 1/2-hour horse training session or riding lesson at High Plains, you transport your horse. 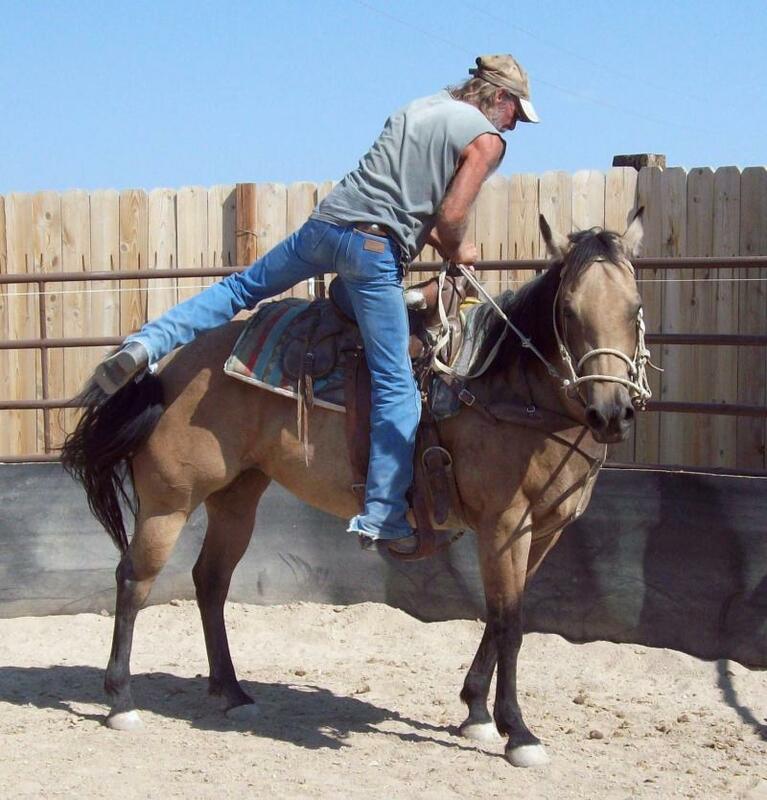 $45 - 1 to 1 1/2 -hour horse training session or riding lesson on your horse at your Pueblo or Pueblo West location. High Plains' facility includes a round pen, arena, obstacle course, and dirt track. When you and your horse are ready to leave the High Plains, there is open space to ride along the public roads and on the public equestrian trails. 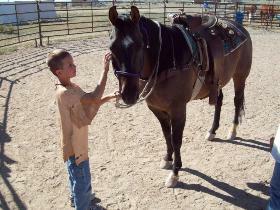 ﻿We offer riding lessons on your horse at High Plains or ﻿at your Pueblo or Pueblo West location. One to 1 1/2-hour private riding lessons at High Plains on your horse, with or without instruction on horsemanship, is $35 per lesson. 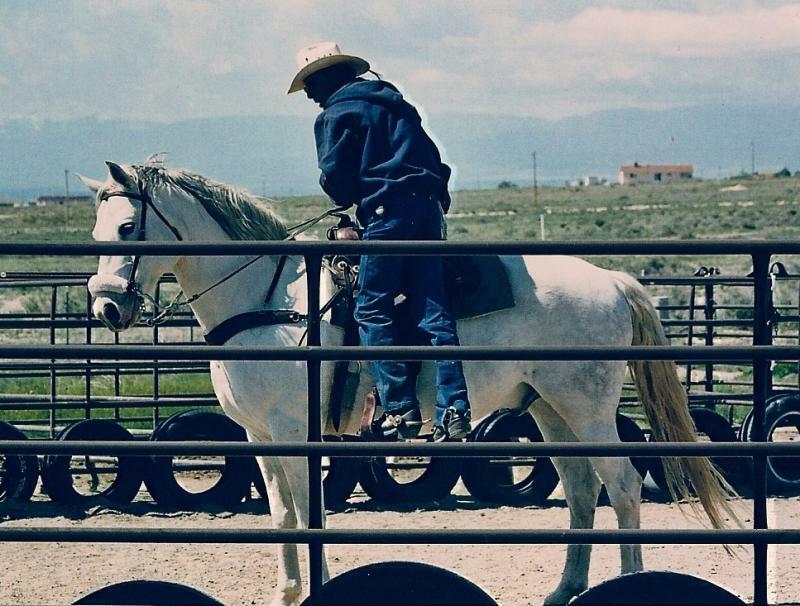 A lesson on your horse at your Pueblo or Pueblo West location is $45. Youths ages 17 and under must be accompanied by a parent or guardian. We encourage students to wear a riding helmet. Are you looking at a specific horse to purchase but wonder if the two of you would be a good fit? Do you know how to lay out your barn and corrals? Are you aware of the costs of horse ownership? Do you know how to handle a horse? Do you know how to take care of a horse? Do you want to enlighten yourself about horses or conquer a fear of horses? We answer these questions and more during your private consultation and tour of our facility. You can learn how to handle, brush, feed, water, exercise, care, and bond with your horse or horses in general. A 1-hour private consultation begins at $35. If you're considering a local horse to purchase or need to set up your corrals, we can look at the horse or your corral site with you. Free Fodder for Thought: If you're considering a new horse for riding, compare your size and the horse's size. Many of our customers have purchased a horse that is too big or too small for them to safely and enjoyably ride.